The Adaptive Dynamics system delivers both precise dynamics and a supple ride by monitoring wheel position and body movements. Electronically controlled dampers adjust to optimize the suspension settings and provide the optimum balance between comfort, refinement and agility at all times. For a tailored driving experience, JaguarDrive Control allows you to select Comfort, Eco, Dynamic or Rain / Ice / Snow — each subtly changing the steering and throttle mapping. A range of wheel options are available to enhance the sporting character of the E-PACE. Choose from a wide selection of contemporary and dynamic designs in a range of sizes up to 21”. 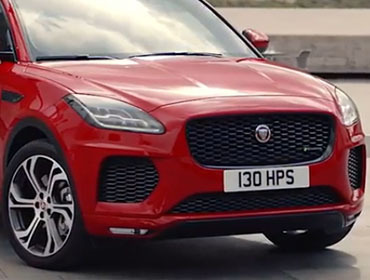 The Jaguar E-PACE looks unmistakably sporty, with its bold honeycomb mesh grille framed by LED headlights. Optional Configurable Ambient Interior Lighting creates a rich visual effect and a welcoming, relaxing atmosphere for all occupants. The system highlights unique design details with soft pools of light in a choice of ten different colors. Powered gesture tailgate enables the driver to operate the tailgate from the curbside, without needing to physically touch either the vehicle or the key fob. Gently present your foot under one of the car’s rear flanks and the tailgate opens or closes. Wherever you need to go, whatever you need to take, the E‑PACE is designed to carry you and your passengers effortlessly, comfortably ‑ and most importantly ‑ safely. 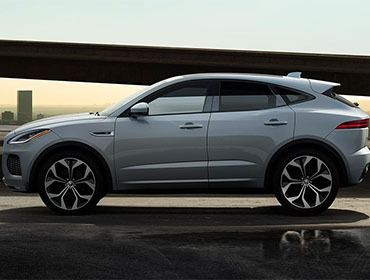 In the E‑PACE, every component has been meticulously designed to deliver a refined, tactile experience. The cockpit wraps around the driver, and the SportShift gear selector sits at your fingertips. The stylish infinity rear view mirror has a frameless design. 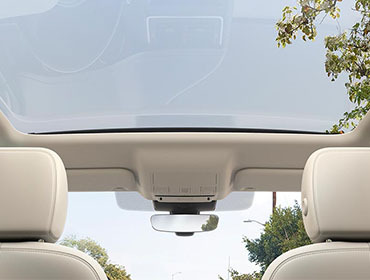 Provides a 360° exterior view via the touchscreen, helping with various maneuvers from parking by a curb to getting in and out of tight spaces and junctions.